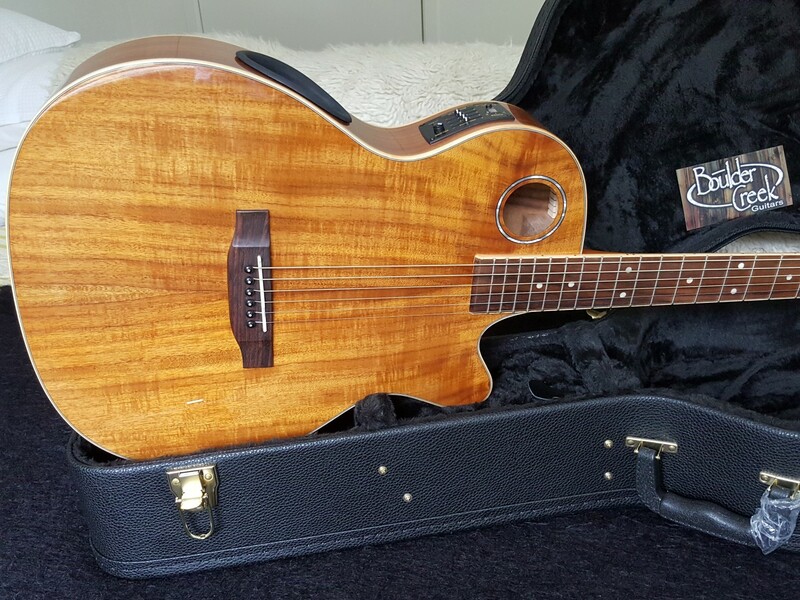 Boulder Creek ECRM6-N - Koa top back & sides, brand new, not been a demo, unplayed. Tone. Projection. Sustain. Even Sonics. Presence. Volume. Tonal Range. Head Room. These are the most important qualities in any acoustic guitar. BOULDER CREEK's Acoustic guitars are known for their playability, rich tone, fat sustain and bold looks. The designs are radical, the concept is avant-garde and along with midlevel pricing the X-bracing system acoustically improves the sound for the player's benefit. Boulder Creek's Suspended Bracing System (SBS), has two tone bars suspended ¼ inch below the top soundboard giving greater resonance while better transmitting string energy throughout the body of the guitar. BOULDER CREEK has a soundport, cut into the side, facing up toward the player's ear. Guitarists spend most of the time playing by themselves, the soundport is a great player benefit? BOULDER CREEK's exclusive AB4-T preamp with undersaddle piezo pickup, features a four-band EQ, chromatic tuner, phase polarity button, and gain. It has two outputs, a ¼-inch and an XLR, which can be used simultaneously. The XLR goes directly to the soundboard without need for impedance matching, and players can use the ¼-inch jack on stage with an amplifier. Nut Width - 1 11/16? Includes BOULDER CREEK Hard Shell Case.